Zineryt 30ml Solution is used to treat acne. 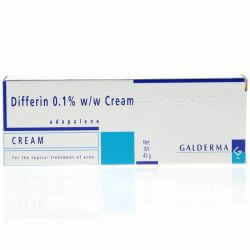 The two active ingredients - erythromycin and zince acetate - work by reducing the growth of the bacteria which causes acne. Zineryt is available as a 30ml or 90ml solution. 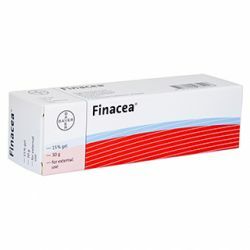 The Zineryt 30ml Solution will come pre-made by the pharmacy when it arrives, with the expiry date on the dispensing label and written on the box. Zineryt 30ml Solution should be kept out of reach and sight of children. It should not be stored above 25 degrees celcius and discarded 8 weeks after preparation. When using Zineryt 30ml Solution, you should follow the instructions given to you by your doctor. Zineryt is for external use only. Wash the affected area well, rinsing with warm water and pat drying. Unscrew the protective cap and hold the bottle upside down. Place the pad against the skin and spread the solution over the whole of the affected area. The flow of solution can be increased by increasing the pressure of the pad on the skin. Don't worry if you use too much of the solution, just blot it off with some toilet tissue. If you forget to apply the solution, don't worry, just apply it when you remember. Leave at least a three hour gap between each use. If you stop using Zineryt before being told by your doctor, the acne may come back. The active ingredients in Zineryt 30ml Solution are erythromycin and zinc acetate. Other ingredients include di-isopropyl sebacate and ethanol. 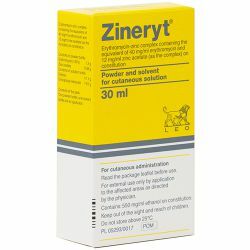 Zineryt 30ml Solution should not be used if you are allergic to any of the ingredients in the medicine. Avoid contact with the eyes, mouth or angles of the nose and other sensitive areas of your body. If accidental contact does occur, wash immediately with warm water. You should make sure to mention if you are taking any other medicines, including medicines obtained without a prescription. If you are pregnant or breast-feeding, think you may be pregnant or are planning to have a baby, ask your doctor for advice before using Zineryt. You may breast-feed during treatment, but you should not use Zineryt on your chest. As with all medicines, Zineryt 30ml Solution can cause side effects, although nor everybody gets them. You should stop using Zineryt immediately and contact your doctor if you notice any signs of an allergic reaction to the product. 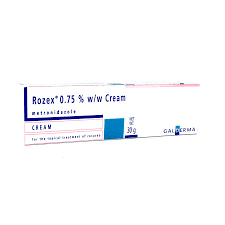 Side effects may include temporary stinging or slight redness of the skin, painful rash, burning feeling. If these side effects occur and do not go away after a few hours, stop using Zineryt and contact your doctor.